For the past few years there’s been a growing concern about the development of the American player. With MLS putting heavy resources into bringing foreign players into the league, the future for domestic talent was left unclear. Questions surfaced about MLS’ ability to simultaneously rise the overall talent level of the league and aide the development for Americans at the same time. Heading into 2018, MLS goalkeepers’ salaries had stagnated in their growth. While it was a problem for the league’s position regardless of nationality, it was a pretty clear sign that American goalkeepers weren’t seeing as much of an investment from the league as other positions were. As teams across the league looked for their Wayne Rooney-equivalent, they also refrained from shelling out for goalkeepers. The past decade has been earmarked with the league cutting corners on not only developing young players but also getting top goalkeepers in the league, which unsurprisingly were tied to each other. MLS has unrolled nine new teams (and lost one) since 2010. The new roster spots have been a nice addition for American players who couldn’t catch on elsewhere in MLS, but the lower leagues have shown more substantial gains in real estate. In the same time span that MLS grew by eight teams, lower tiers (a combination of USL, NASL, and NISA) have grown by a total of 32 teams. How many American goalkeepers earned 10 league appearances by year and age. The top chart is by percentage, while the bottom chart is raw numbers. 2019 are projections. To best show how the landscape has changed for American goalkeepers, I tracked every goalkeeper who made 10 league appearances since 2010 by year and age. It’s not a perfect method, but the goal was to see how teams invested their most valuable (league competition) and regular playing time when it came to their goalkeepers. While late round USOC and CCL games are treated important, most teams’ lineups vary from B+ to C- squads in the early rounds so league play was the most consistent standard when gauging teams’ investments. Looking at the two charts, the yellow-to-white-to-blue scale shows the slices of each group by year. The 34 and older age group has dwindled significantly since 2010, while the 22-25 has doubled. “Non-US” accounts all players who can’t play for the USMNT, with the age of the goalkeeper being irrelevant for this category. Similarly, the second chart (green-white-blue) gives the raw numbers for each section. Again, it’s important to note that these numbers are not roster spots, but a gauge of playing time MLS, USL and NASL teams devoted to the goalkeeping position. It’s one thing to make the game day roster, it’s quite another to play a third of the team’s games. Looking at the numbers, there are three major trends that immediately stand out. 1. Playing time for foreign goalkeepers has stayed fairly consistent - It’s hard to say what a good share of foreigners is in any country’s pyramid should be. When considering American development within the professional game, it’s good to remember that it’s not about removing foreigners but simply getting the correct talent in place. If a MLS, USL, and NISA team can find a better player - in any position - at an appropriate price, raising the level of competition serves teammates and opposition well, regardless of nationality. A notable example of seeing the influence of a high profile athlete transcending nationalities can be found in Peter Schmeichel’s recounting of Gordon Banks’ save against Pele in the 1970 World Cup. The Brit’s performance (a decade before the Danish goalkeeper started as a professional) inspired Schmeichel to play at a higher level, even later recreating his own take on the save. This sort of standard is why goalkeepers like Pat Onstad, Jaime Penedo, and Jorge Campos are important to the American landscape. It’s a tangible goal players (current and young) to aspire towards. The average age of a professional American goalkeeper has dropped from 29 (2010) to 25.77 (2015) and currently sits at 25.83 (2019). 2. Professional American goalkeepers are getting younger - The big reason why the average age has dipped is because USL teams - not MLS - are taking more chances on the recent college graduates. MLS is notorious for struggling to play youngsters, only recently empowering their U23 players. 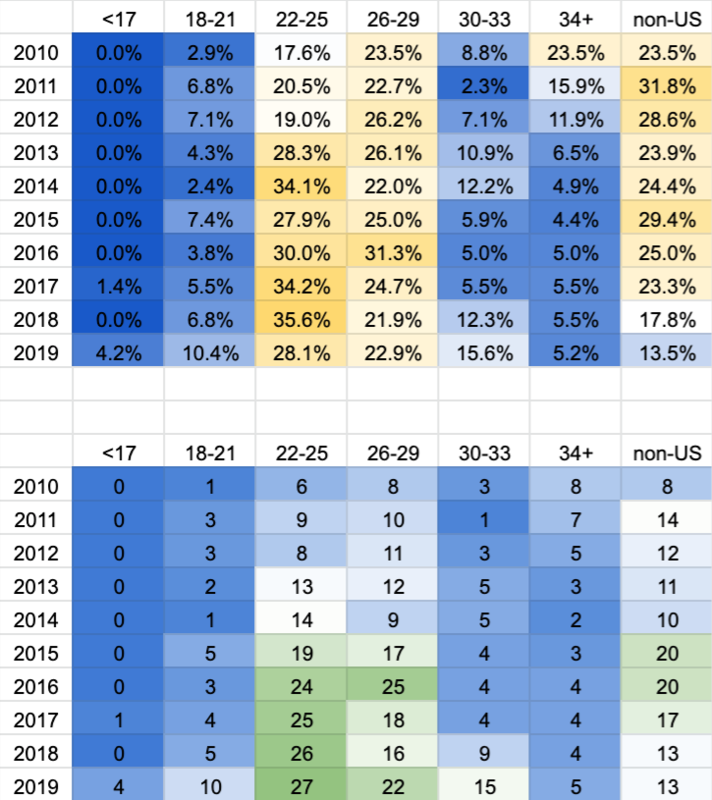 Yet the USL has been increasingly kind to young players and are the main reason for why 35.6% of the counted goalkeepers land in the 22-25 age range. The trend is now bleeding into the 18-21 age bracket, with five college-aged Americans earning ten league starts in 2018. Ten goalkeepers are currently on track to double last year’s numbers. It’s hard to see where the ceiling is for U20 goalkeepers getting time but for now American goalkeepers are getting younger by the minute. 3. Late teenagers are opting out of college - Los Angeles Galaxy’s USL side paved the way for USL teams knowing how to place responsibility on a young goalkeeper’s shoulders. Originally leaning on early-to-mid 20 year olds like Brian Rowe, Brian Perk and Celement Diop, Galaxy reset their course and immediately invested in Eric Lopez, giving the 17-year-old a dozen starts in 2017, the most for any goalkeeper on the roster. They doubled down on their commitment to young goalkeepers by bringing in Justin vom Steeg and Abraham Romero. Since then, Abraham Rodriguez (16, Colorado Springs), Aaron Cervantes (17, Orange County), David Ochoa (17, Real Monarchs), Luca Mancuso (17, Orlando B), and Max Trejo (17, Swope Park Rangers) have all earned a start in USL action just one month into the season. Perhaps most notably, two of these five goalkeepers aren’t MLS affiliates, meaning teams that aren’t a direct feeder into an MLS side are starting to invest in young players as well. It’s an unheard time in American goalkeeping and one that will start to undo the fractured goalkeeping environment that’s plagued player development for the past two decades. It’s been a painfully slow progress to get to this point but the last few years have seen doors open in ways that didn’t exist before. Ultimately if MLS teams want to continue to flip future Zack Steffens for $8-to-10 million dollars, they need to continue to flesh out player development for 18-23 year olds. If the NCAA continues to show no interest in adapting to the modern game and best serve the student-athlete, the responsibility falls on the USL to help bridge the gap for aspiring players to reach their potential. A few years ago, signing with a USL side for $8,000 only to sit the bench was less than a desirable option, but with promising roads being paved to MLS and perhaps beyond, don’t be surprised to see even more young players jump straight to the pro game as soon as possible. After months of teasing a list, Stan Anderson and Bill Reno reveal their picks for their top ten goalkeepers in NCAA’s men’s D-1 play since 1970. To hear the rationale behind the picks, head over to the latest podcast (click here).